Mayor Bill de Blasio is supporting the New York Police Department's discriminatory surveillance of Muslim communities in the city and elsewhere to detect terror threats, newly filed court papers show. The papers were filed by the city in opposition to an appeal of a decision by a federal judge in New Jersey finding that the practice is lawful. 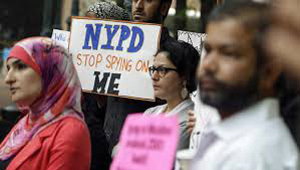 The decision tossed out a 2012 lawsuit accusing the NYPD of illegally spying on ordinary people at mosques, restaurants and schools in New Jersey based on religion and race in the aftermath of the Sept. 11, 2001, terror attacks. The groups Muslim Advocates and the Center for Constitutional Rights filed the appeal. Former Mayor Michael Bloomberg and former Police Commissioner Raymond Kelly were staunch supporters of the surveillance programs, saying they were needed to protect the city from terrorism. After de Blasio took office this year, the department disbanded a unit assigned to build databases on where Muslims lived, shopped, worked and prayed – a move the mayor called "a critical step forward in easing tensions between the police and the communities they serve." But with the new filing, the city is defending "an assertion that the police can single out an entire class of people on the basis of their religion and treat them differently," said Baher Azmy, legal Director of the Center for Constitutional Rights. "In effect, the city relies on the events of 9/11 to justify treating all Muslims in this country as second class citizens." Glenn Katon, a lawyer with the group Muslim Advocates, said the city's brief "shows that the new administration does not care about protecting Americans' basic right to pray." A statement from the city Law Department said the brief was being misinterpreted. "This filing does not address broader policy issues concerning surveillance of Muslim communities, but rather technical legal issues," the statement said. The city's brief denies the department did any spying. It says the NYPD's goal was to identify places where a potential terrorist might hide out and recruit others to join in a plot against the city. "A comprehensive understanding of the makeup of the community would help the NYPD figure out where to look and where not to look in the event it received information that an Islamist radicalized to violence may be secreting himself in New Jersey," the papers say. "In fact, it would be irresponsible for the NYPD not to have an understanding of the varied mosaic that is the Muslim community to respond to such threats." In the papers, the city also agrees with the lower court finding that any harm done to the plaintiff came as the result of a series of stories by The Associated Press based on confidential NYPD documents showing how the department sought to infiltrate dozens of mosques and Muslim student groups and investigated hundreds in New York and elsewhere.